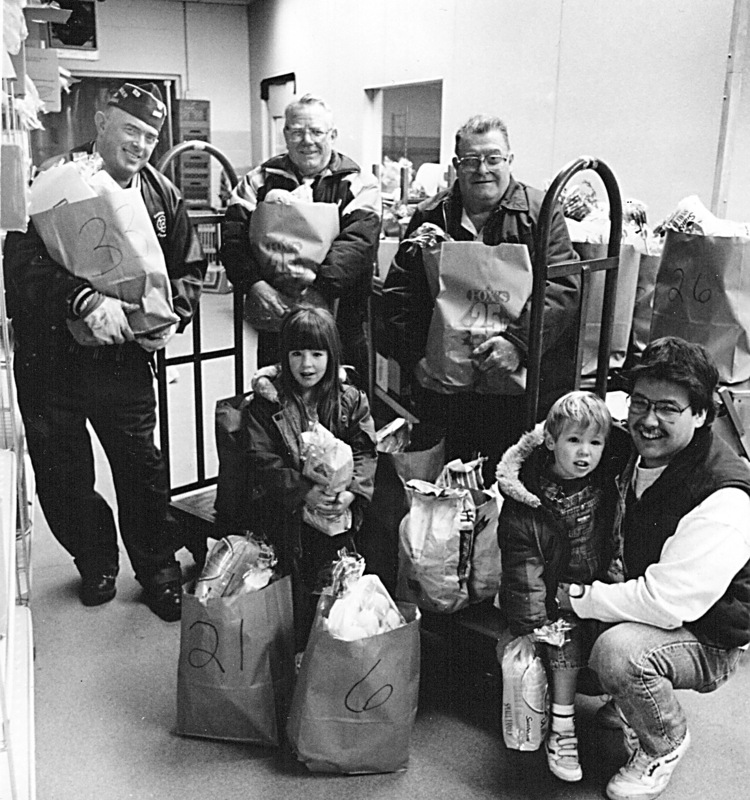 Veteran Vittles – Fire up the oven and prepare to cook a Christmas feast second to none if you are one of the needy families who were assisted by the Middletown’s veterans and the local Elks Post. Workers gathered early Saturday, December 18 at Fox’s to pick up and then later distribute the sustenance. Pictured from left are George Rudy, VFW Post 1620; Ed Baumbach, American Legion Post 594; Ed Hahn, Elks Post 1092; and Heather Chestnut, Steven Chestnut Jr. and Steven Chestnut Sr., manager of Fox’s Market in Middletown. Say it ain’t so, Santa! You’re not really hanging up your red suit, are you? Wellington “Bill” York, a longtime local portrayer of the jolly old elf, is calling it quits – but only partially. It seems he’ll go out of the Claus business the same way he came into it: by donning the white beard and wig for family and friends a special holiday occasions only. A New Years Day baby, York will turn 77 next week. His late wife Madeline, who passed away last June, had discussed Santa’s pending retirement many times with her husband, and the two of them had decided together that Christmas 1993 would be his last formal appearance. “I’m fulfilling both her dream and mine, because she enjoyed Christmas and Santa as much as I do,” York says. In fact, Santa’s last stand (or is it sit?) was supposed to take place several years ago, York explains, but was delayed with the birth of his great-granddaughter. With 41 years of Christmas work under his jumbo-sized belt, it’s no surprise that York has gone through six Santa suits while playing the role. And for the first half of his career as Saint Nick, he didn’t need to wear the pillow. An exhaustive study of south-central Pennsylvania’s air transportation needs has revealed that Harrisburg International Airport (HIA) should be more than able to accommodate the region’s growth for many years to come. The preliminary finding, part of an ongoing “aviation needs survey” commissioned by the Susquehanna Valley Regional Airport Authority (SVRAA), was a relief to many local leaders who feared that HIA could be replaced by another major airport elsewhere in the region. While the final results of the nine-month, $240,000 study are not expected to be complete until April, SVRAA officials say they are satisfied with the analysis of HIA’s capacity thus far and are recommending that the airport’s owner, the Pennsylvania Department of Transportation (PennDOT), continue to follow its 20-year master plan for improvements and expansion at the Lower Swatara Township facility. The inquiry, now being conducted by one of the nation’s top aviation consulting firms – Apogee Research, Inc. of Bethesda, Maryland – is expected to provide a glimpse into HIA’s future based on projections for the area’s continuing population growth and significant business development. However, at a public workshop session in Harrisburg on Thur., Dec. 16, members of SVRAA and representatives of Apogee’s consulting team were careful to list additional considerations that could affect their prediction for better or worse. Those factors include: competition from new airlines entering the eastern U.S. market; the airline industry’s desire to create more low-cost, regional airlines; changes in south-central Pa.’s economy and demographics; and ever-changing environmental regulations. “I would call it a last stop before expulsion,” explained Dr. Jeffrey Miller, Lower Dauphin’s superintendent of schools, in describing an alternative school for students with severe discipline problems. But instead of a show of support, Miller heard doubts and questions at the Board’s December meeting from school directors who were wary of such a program. Miller explained that area school districts have taken part in preliminary talks exploring the possibility of setting up an alternative school for students with severe discipline problems. He named Central Dauphin, Susquehanna, Middletown and Harrisburg as those involved in the discussions. Harrisburg and Central Dauphin, Miller said, currently run similar programs on their own. Lower Dauphin currently has a 10-day in-school suspension program at the senior high. The proposed school would accept students from grades seven through 12. “My concern is that we have no option but expulsion,” Miller continued. He explained that parents of an expelled student have 30 days to find a suitable program. If they are unable to place the student, then the school district has to provide either a tutor or some type of private schooling. Hormel Bulk Stick Pepperoni, $4.38/lb. Center Cut Pork Chops, $1.88/lb. Whole Boneless Fresh Hams, $1.99/lb.